An ancient cistern in the Negev Highland area, located south of Mt. Hemet. 2 Chronicles 26 9-10: Uzziah built ... towers in the desert, and digged many wells...". 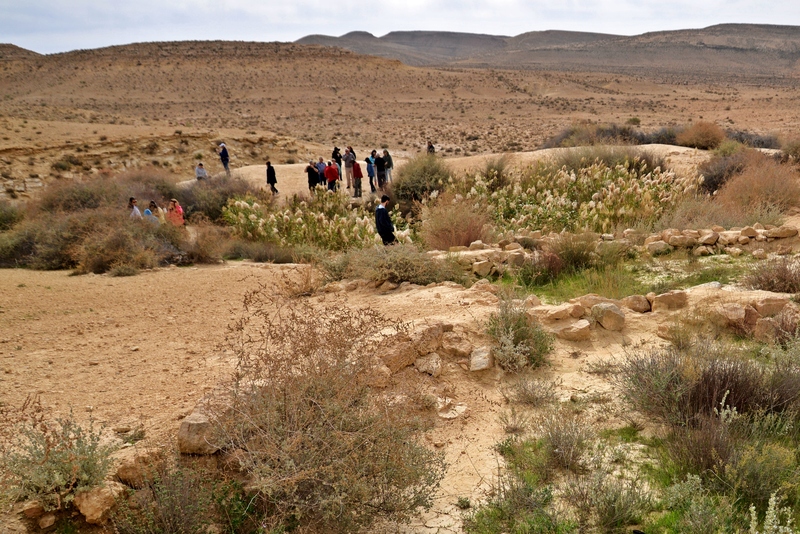 This the largest ancient cistern in the Negev Highland area. It is dated to the Israelite Kingdom period (10th-6th Century BC). The site is located on the side of road #171, south of Mt. 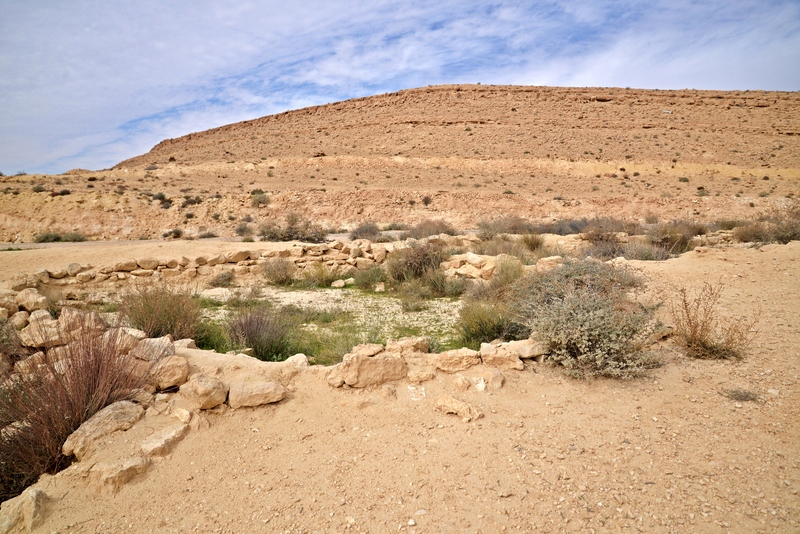 Hemet (Jabal Hammathiah), one of the mountains north of Makhtesh Ramon. You can point on the yellow points to navigate to the selected site in this page. "Moreover Uzziah built towers in Jerusalem ... Also he built towers in the desert, and digged many wells: for he had much cattle, both in the low country, and in the plains...". The cistern was first restored in 1981. 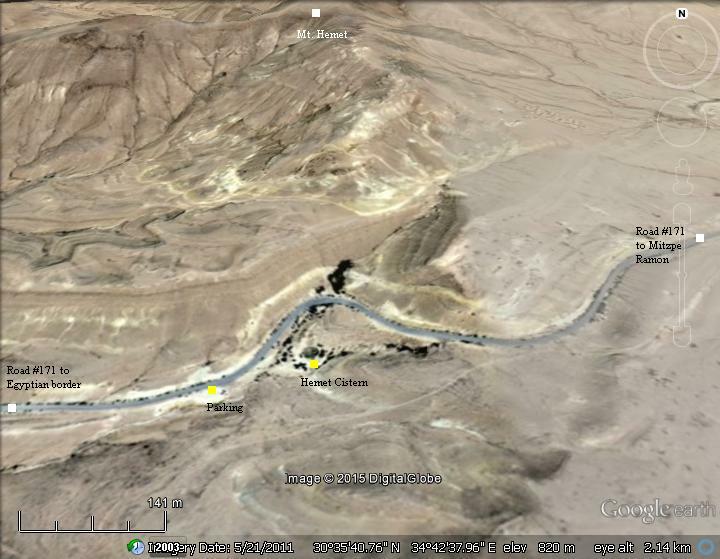 The cistern is located on the side of road #171, after a sharp turn of the road. A parking place is located on the west side, and then a short walk leads to the cistern. 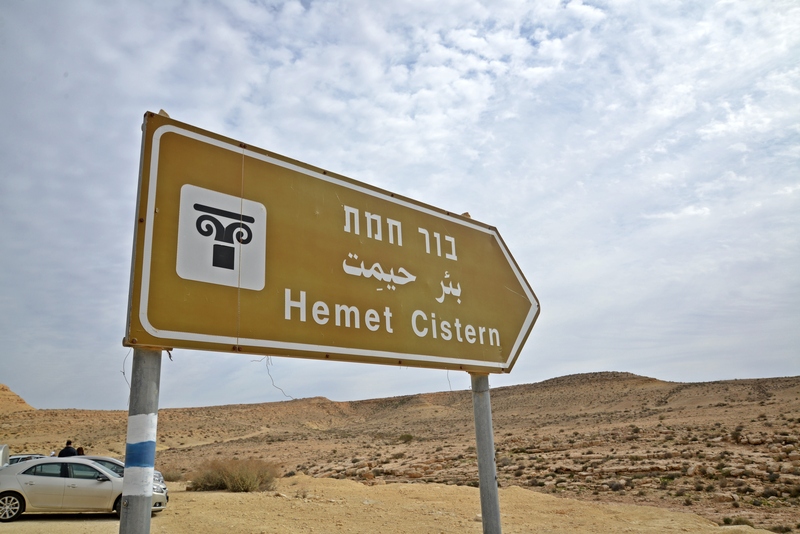 Hemet cistern is the largest of its kind in the Negev, an oval-shaped open cistern measuring 16m (52 ft) by 18m (59ft). This photo is a view from the north side. The people are standing around the perimeter of the pool. 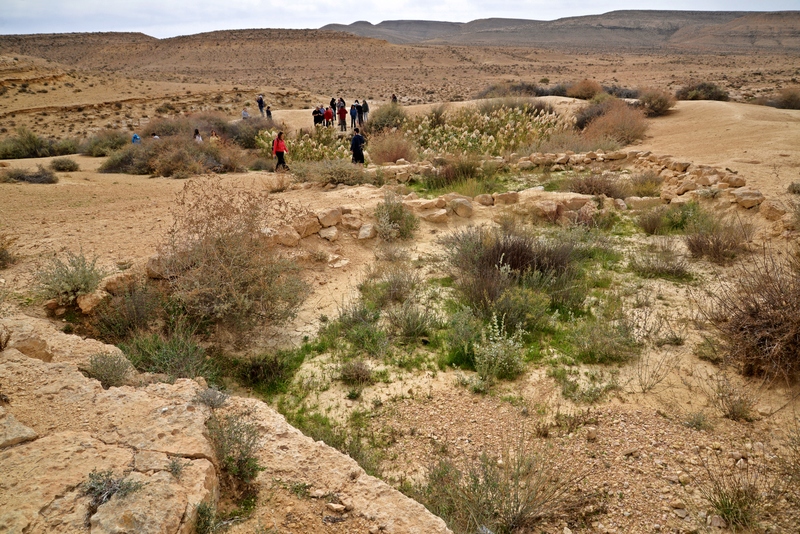 In the foreground is a system of sediment pools that kept the cistern clear of the runoff soil. 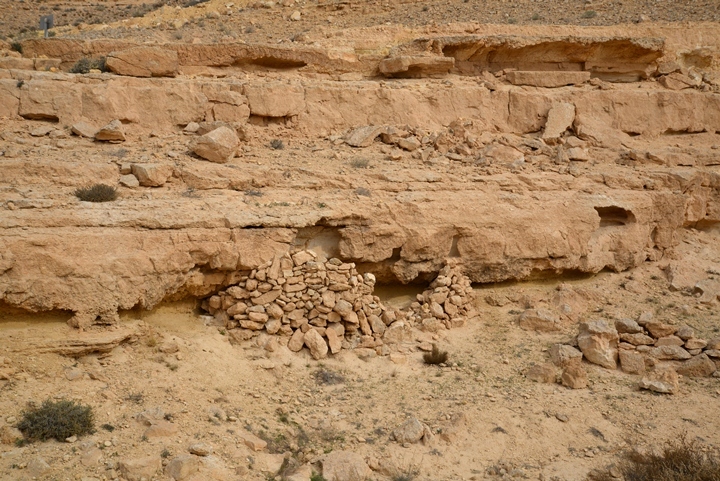 The walls of the open cistern are lined with rough hewn stones. The cistern, with an approximate 5m (16 ft) depth, was dug into the chalk. Steps lead down from the north side, as seen in the following photo. The vegetation currently fills up the pool. Webmaster Rotem's mother, Orna, poses in front of the cistern. In the background is a section of the canyon walls that engulf the site on the north side. Behind is Mt. Hemet, which is 100m higher than this location. 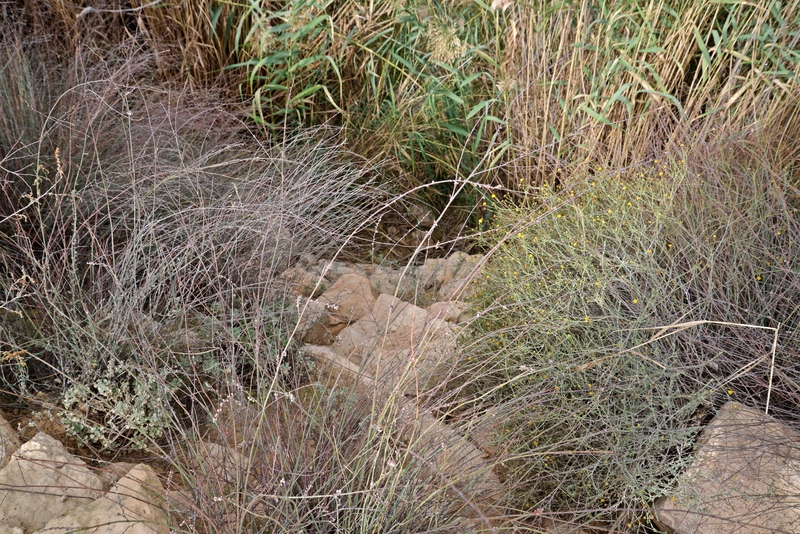 The next photo was captured (by Uncle Amnon in June 2012) when the vegetation level was still low. Here it is clearer to see that the walls are lined with rough hewn stones. The cistern was fed from a conduit, that feeds into a system of three sedimentation basins. 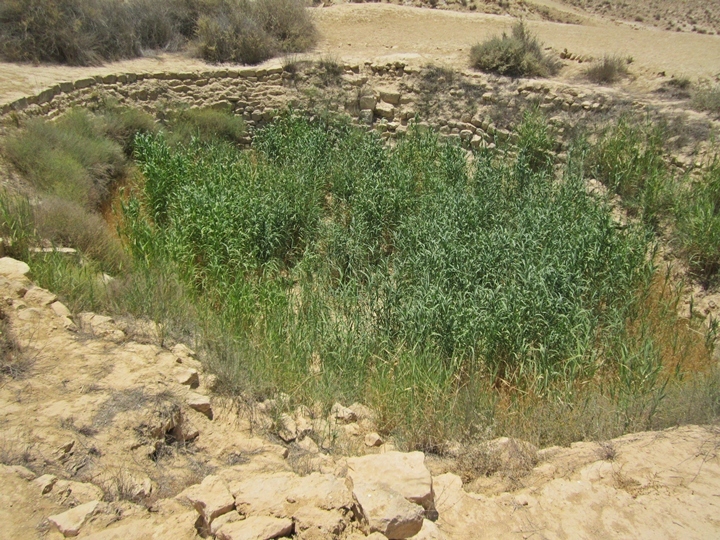 The sediment pools serve as settling ponds, which were built in order to capture the soil washed off during rain storms, thus protecting the water reservoir. 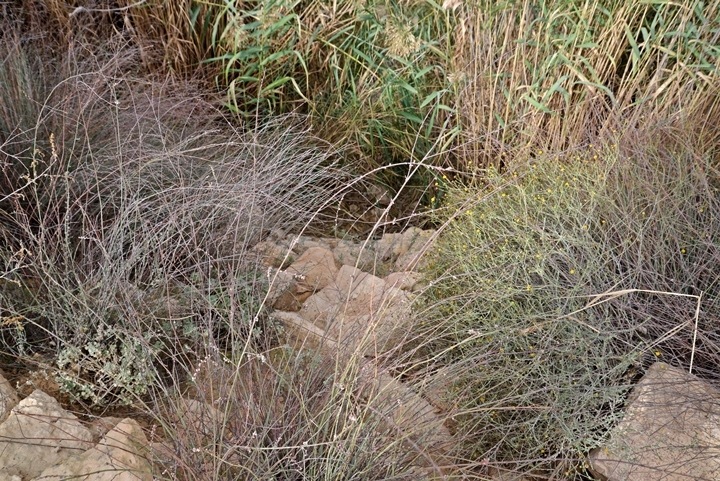 The soil settles into the series of ponds before discharging into the cistern. The valley from the east side collected the runoff surface rain. The waters were conveyed to the sediment pools by a 200m (218 yards) long conduit. The following photo shows a view towards the valley. The modern road is located just above the edge of the valley on the left side. On the side of the valley are remains of a makeshift shelter, perhaps modern. A view towards the west side is in the next photo. The cistern is located behind the single standing tree. A lone ancient tree stands on the east side of the cistern. This tree is of the type is called in Hebrew "Atlantic Elah". The scientific name is Pistacia Atlantica, and is commonly known as "Mt. Atlas mastic" tree and "Persian turpentine" tree. There are many (1,400!) 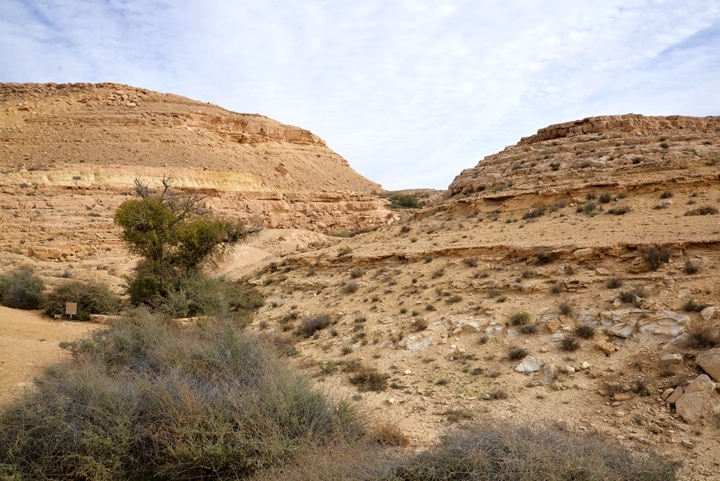 such Elah trees in the highland area of the Negev desert, some of them are hundred of years old. For example, some of the the Elah trees in the nearby Loz Cisterns are 250 years old (reference: Seker Etzim Bogrim, file 129). These trees grow near the center of the valleys, a short safe distance from the path of the flash floods. 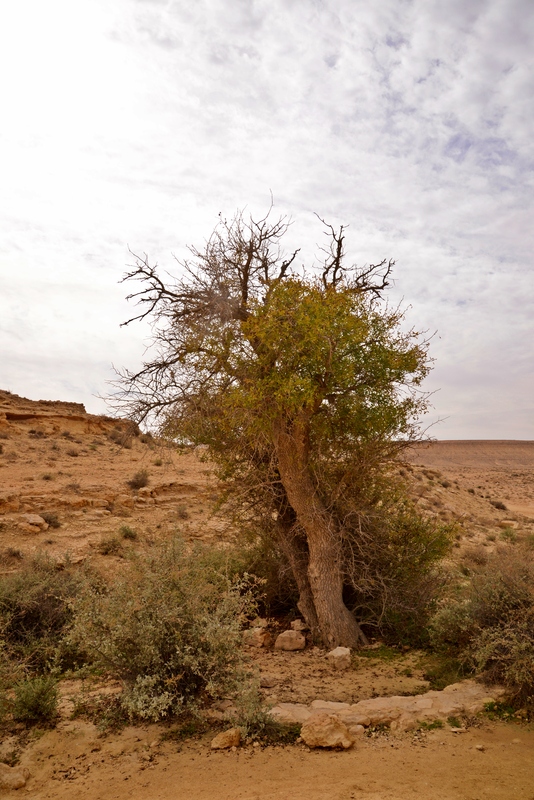 How do such trees propagate and survive in this harsh desert conditions? The seeds of the tree are eaten by birds, but survive the birds' digestion system. The birds then extract the seeds onto rock surfaces. After a rain, the seed roots, reaching water that accumulates from the runoff rain in the cracks and pockets under the rock. 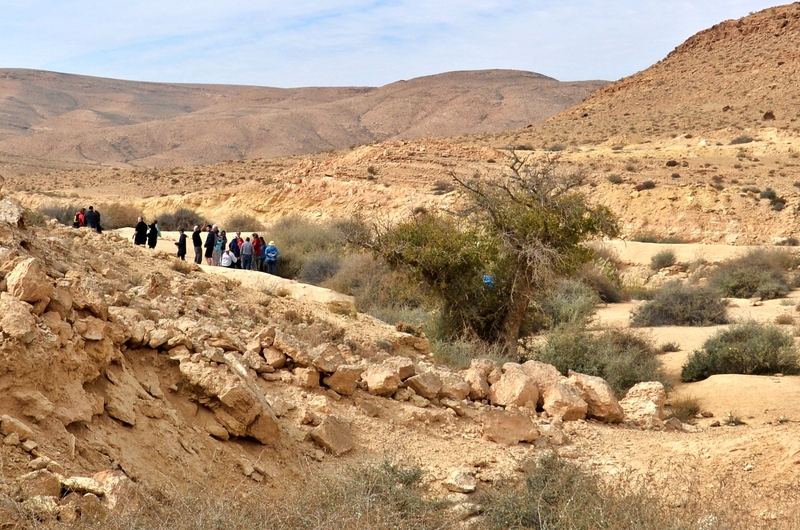 The Elah tree, after growing from the seed, uses deep roots to search for the scarce underground water, thus surviving the dry season. Hemet, Hammat - the name of the mountain north of the cistern. A modern Hebrew name based on the Arabic name. Jabal - Arabic for: mountain. 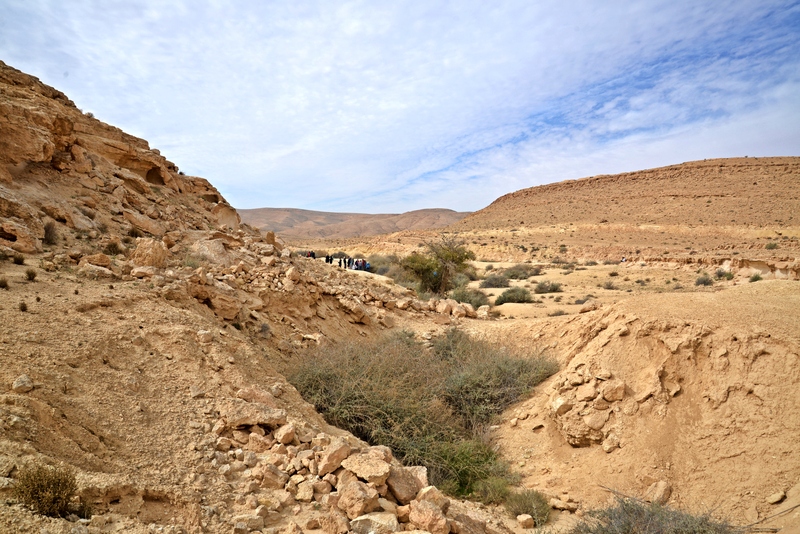 Jabal Hammathiah - Arabic name of the mountain. Unknown meaning. Cistern - waterproof reservoir which holds water (based on the Latin word "Cist" - box). 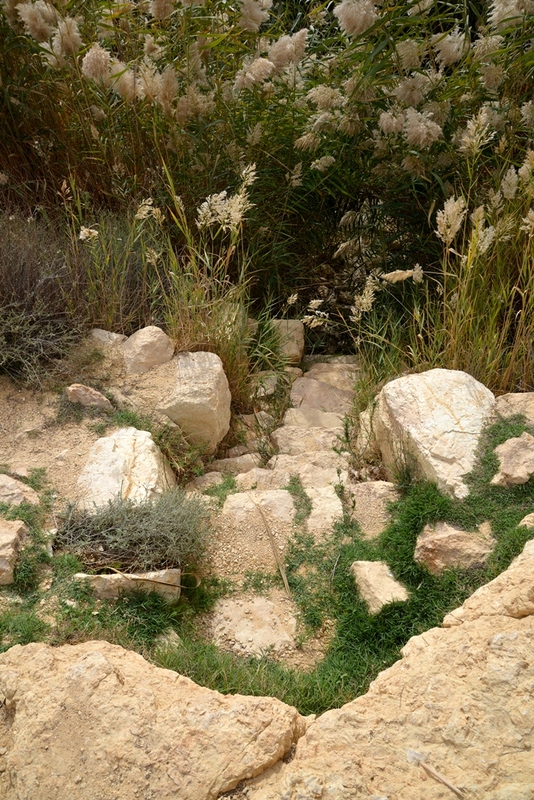 Bor - Hebrew for cistern or pit. Appears 35 times in the Bible. Nitzana, Nizzana - Unknown source, perhaps based on the Hebrew word "Nitzan" - bud. 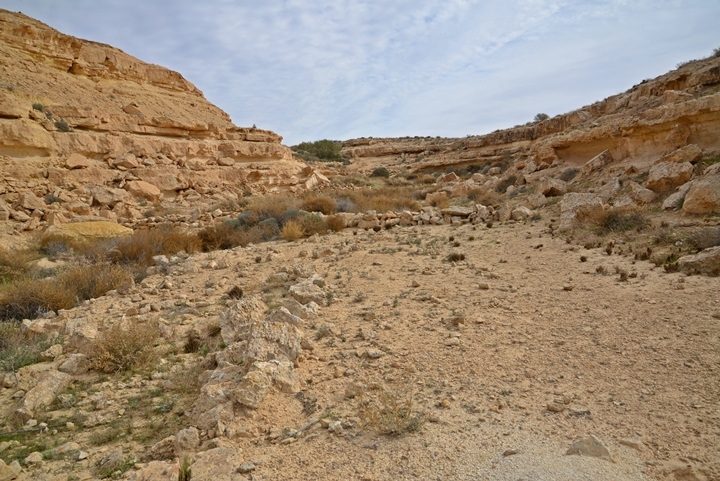 Survey of Israel's ancient trees (1990-2005) - pdf; Hebrew.